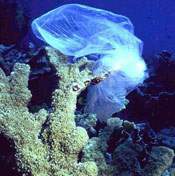 Plastic bags can entangle or choke fish, turtles, birds and other animals that mistake the plastic for food. Plastic bags contribute to litter, especially because they are easily carried by the wind. Knot them to prevent fly-aways. Single use plastic bags are not consistent with the County’s goal to reduce the quantity of materials going into the landfills. 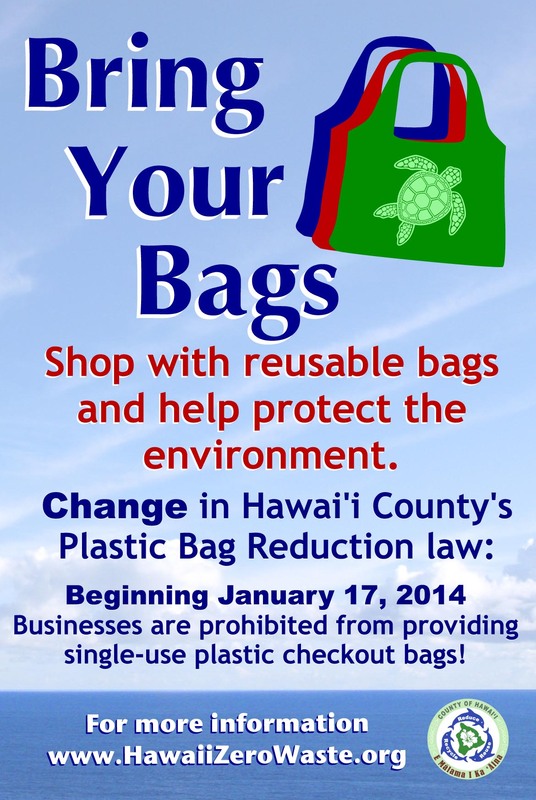 Hawai‘i is the first state to have plastic bag reduction laws in all counties! 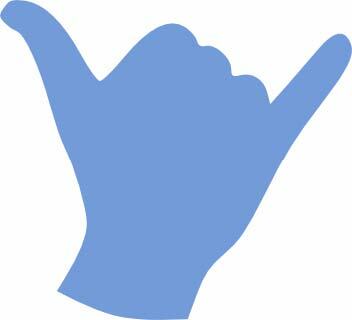 All County of Hawai‘i businesses including groceries, restaurants, farmer’s markets and other retailers must comply. Beginning January 17, 2013, if stores provided single use plastic carryout bags, they were required to charge a fee. Starting on January 17, 2014, all single-use plastic carryout bags are prohibited. It does not regulate paper bags or fees for reusable bags. Click on the links at the bottom of this page to see the complete ordinance, the adopted administrative rules and other information. 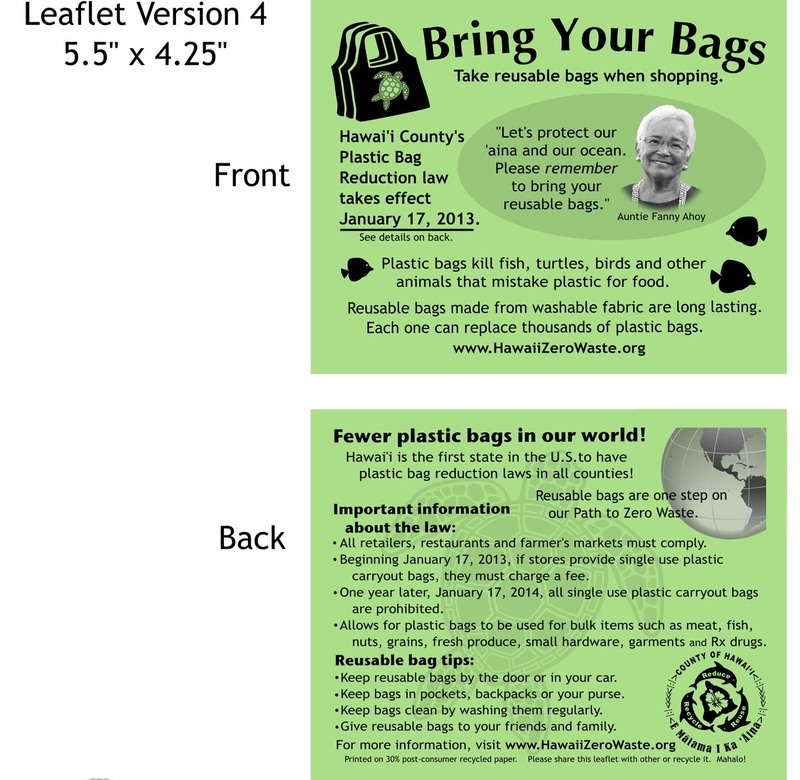 For more information on the law and answers to many questions please read our Plastic Bag Reduction Ordinance – Frequently Asked Questions. A high-quality reusable bag has the potential to replace over 600 single-use plastic bags over its lifetime. Paper bags are not the best alternative to a single-use plastic bag. It takes 14 million trees each year in the United States to produce a year’s supply of paper bags for retail use. 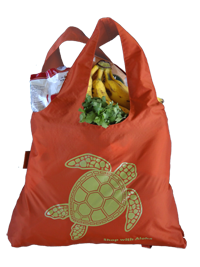 Reusable bags reduce litter and conserve natural resources; making them the best choice! Shop with Aloha and bring your reusable bag! Keep reusable bags by the door, in your car, or near your car keys. Keep foldable bags in pockets, backpacks, or your purse. Keep bags clean by washing them regularly. For some helpful tips on maintaining Germ-free Re-Usable Bags check out the flyer by the Nutrition Education for Wellness Program of the UH Cooperative Extension Service. Give reusable bags to your friends & family. They make great gifts. Notice: Public hearings regarding the administrative rules relating to the law were held on December 6, 2012 in West Hawai‘i at the West Hawai‘i Civic Center in Kailua-Kona and December 12, 2012 in East Hawai‘i at the Aupuni Center in Hilo. Please see the following links for a copy of the hearing notice and details about the meeting locations and rules.